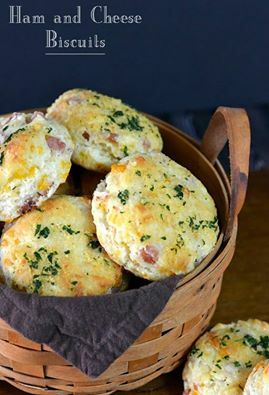 These Ham and Cheese Biscuits have so much flavor and go perfectly with any meal. You should try it! Preheat oven to 425 degrees. In a large mixing bowl add the flour, baking powder, baking soda, and salt. Stir to combine. Using a pastry blender cut in the butter until the flour resembles the texture of oatmeal. Stir in the ham and cheese. Add the buttermilk, stir just until combined. On a lightly floured surface, roll dough to a ³/₄-inch thickness. Use a 2 ¹/₂-inch biscuit cutter to cut biscuits; place on a un-greased cookie sheet. Gather the dough scraps, roll out again, and cut biscuits. Continue until all the dough has been used. Bake 12 to 15 minutes or until golden brown. For the Topping: Place butter in a small microwave-safe bowl, melt butter; stir in the parsley and garlic powder. Brush the melted butter mixture on top of each biscuit, return to the oven and bake an additional 2 minutes.